Written by Max Landis (son of the once great John Landis) and directed by Josh Trank, Chronicle is one of the smartest entries yet into the found-footage genre and a witty indie deconstruction of the still popular superhero movie. It also boasts stand-out performances from its young leads Dane DeHaan (True Blood), Alex Russell (Almost Kings, Wasted On The Young) and Michael B Jordan (Law & Order: Criminal Intent). Not widely seen in the UK as yet, it's certainly struck a chord with many who have seen it, being described by Roger Ebert as "an uncommonly entertaining movie that involves elements of a superhero origin story, a science-fic­tion fantasy and a drama about a disturbed teenager," by Mark Dinning in Empire as "a stunning superhero/sci-fi that has appeared out of nowhere to demand your immediate attention," and by David Graham at Eye for Film as "an immensely enjoyable and engrossing spin on several well-worn themes and genres, promising further great things to come for and from its youthful creators." Worth a look, then. 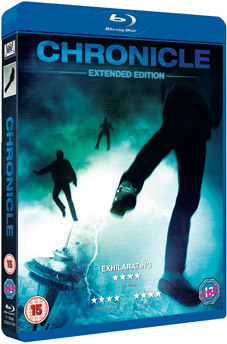 Chronicle will be released on UK Blu-ray and DVD on 28th May 2012 by 20th Century Fox at the RRP of £19.99 for the DVD and a whopping £27.99 for the Blu-ray.